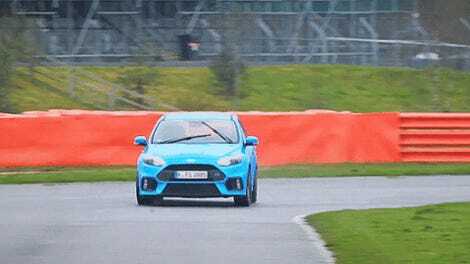 We recently got our hands on a Ford Focus RS to see if the much-ballyhooed Drift Mode is actually any faster than the car’s more normal high-performance Track Mode, or if Drift Mode was just a bunch of pointless powersliding. As it turns out, on loose surfaces, Drift Mode is way, way, way faster than we expected. Drift Mode, as you’ll recall, sends more power to the all-wheel drive Focus RS’ back wheels and also softens the dampers and steering to make it easier to catch the slide. We found it pretty easy to use on our first drive. But we had to test it further. This is Team O’Neil Rally School’s somewhat-modified Ford Focus RS demo car. It has: new rally-spec Bilstein shocks, a Mountune tune for a bit of extra power, and no ABS. The ABS would have cut in and made us skid into a tree, if that explains anything. Other than those tweaks, this was still a Focus RS with its Drift Mode. I drove it to see how it feels (hilarious) and 2011 two-wheel drive national Rally America champion Wyatt Knox tested the car against the clock to see which mode was faster. Over the short snow-and-gravel course Wyatt and Team O’Neil set up, Drift Mode was a massive five second quicker than track mode. Watch the whole video for Wyatt explaining why, on the loose, Drift Mode is so much quicker.